Italian food is one of my favourite cuisines. I cannot have enough of it! Whether it comes in big portions at family restaurants or small portions at fine dining places, I love them all! It’s no secret one of my favourite kind of food to cook is italian. Especially pasta! One of the staples in this household is spaghetti and meatballs. Another is spaghetti bolognese. Especially on days that I have work or uni. Just cause it’s so quick and easy to whip up and it’s always yummy! (: And thoroughly enjoyed by everyone! However, on days that I have time to just be in the kitchen and cook something I really love, one of the few things I end up making is risotto. One of my all time favourite risotto is without a doubt mushroom risotto. Especially when there is porcini in it. The flavour would just be so intense. I could fall in love. (: and with a mixture of different kinds of mushrooms. Just talking about it puts a smile on my face! So after weeks of work and a hectic week of rushing an assignment to meet a deadline. I finally got a chance to be in the kitchen and cook something I love without rushing. Having the time to myself just to enjoy the whole process. And gain some arm muscles, I must add, with all the stirring. haha. So here is the recipe I came up with on my own! An original! Whoopeedoo! hehe Always exciting to come up with my own recipe. Hope you all will enjoy it! 1. 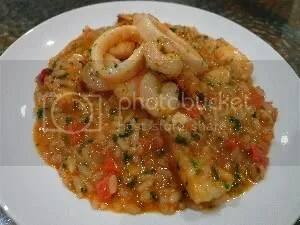 For the seafood: Heat 1 tbs of olive oil in a frying pan, and add 1 tbs of chopped onion and 1 tsp chopped garlic. Fry till fragrant. Add 1 tsp of chopped sundried tomatoes and fry for a couple more minutes. 2. Add the seafood and allow it to fry for 5 mins. Add the chilli powder and fry for another minute. Set a bit of the seafood aside to garnish. 3. For the risotto: Heat 2 tbs of olive oil in a deep frying pan, add the rest of the chopped onion, garlic and sundried tomatoes and fry till onion becomes translucent and is softened (about 5 mins). Add the rice and make sure the rice gets coated with the oil. 4. Pour the wine into the frying pan and stir until it has reduced to half. Add the chopped tomatoes and two ladles of stock and stir continuously until absorbed. Continue to add the stock (1 ladle at the time), stirring occasionally, until the rice is cooked but still al dente. This should take about 20-25 minutes. 5. 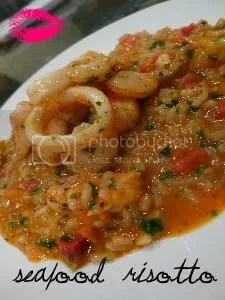 Stir in the seafood, paprika, tomato paste and yogurt and stir till well combined (Stir gently, so that the fish will not crumble. You want it to keep its shape!). Add the parmesan and butter into the risotto. Season to taste. 6. Divide into plates, lightly tap it to allow it to spread. Place the seafood that was set aside on top to garnish. Top with parmesan and serve. 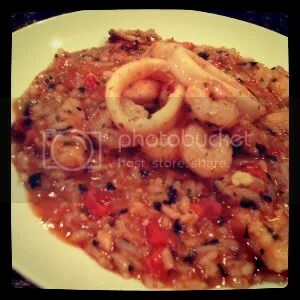 I love love love risotto and this just looks incredible!